Joseph Oldham, 'of this parish, single man', and Mary Wood 'of this parish, single woman, with consent of parents' were married 'by licence' in Melton on Thursday 14 Jan 1779 by Thomas Lambert, Rector. Both Joseph and Mary signed and the witnesses were 'C.Jeaffreson', (Christopher), and Richard Wood, junior, Mary's brother. See the Searles family for the identity of Christopher Jeaffreson. Others present at this marriage are listed in the Wood Family Bible, Mary's mother Jane Searles, Christopher Jeaffreson's wife, (Mary), and a Miss Harvey. There is also an unknown person 'Williamson' but his name appearing after that of the vicar he could be the parish clerk. Following on from the above there is no evidence to say whether Joseph Oldham came from Melton himself or whether he only settled there on his marriage, but certainly he remained there from 1779 for the rest of his life. The earliest reference to Joseph found so far is from the Norfolk Chronicle of 18 Aug 1781 found in the archives of the Rootsweb mailing lists 'OLDHAM, Melton' was among many other grocers in Suffolk, selling the 'incomparable Ointment for the Itch which has been proved upwards of fifty years to cure that Complaint within eight Hours'. It sold at '1 shilling and 6 pence a Ball, for grown Persons, and 1 shilling for Children'. I. Joseph Oldham m. Mary Wood on Wed. 27 Jun 1759 at St Andrew's Old Church, Melton. (For possible connections see Oldhams Pt.1). Mary Wood was the daughter of Richard Wood and Jane (see the Wood Family pt 2 for details) . They had 15 children, perhaps even 16. No 9 below, John Oldham, is next on the 'main line'. His daughter, Martha, married Robert Stockwell. Follow the link to bypass the rest of this family. Further documents found online late in 2008 reveal that Joseph was declared bankrupt just 200 years earlier. All persons who had claims outstanding against him were told on 6 Aug 1808 to give notice to John Wood of Woodbridge (Joseph's brother-in-law) or Messrs Barry & James, solicitors, Bucklersbury, London. Proceedings were called for on 27 Aug 1808 as detailed on that date in the London Gazette. A meeting was scheduled for 12 noon at the White Hart in Wickham Market on 23rd Sep when the necessary arrangements were to be made to dispose of his assets by sale or private contract. On 21 Jan 1809 Joseph, described as 'Draper and Grocer, Dealer and Chapman' was declared to have fulfilled all conditions as laid down in Acts of Parliament. He was, as suspected, entitled to call himself 'Gent.' The final meeting was on 16th Feb 1809 at 11am at the White Hart in order to make a 'Dividend of the Estate and Effects', after which any further claims would be disallowed. Impressed with a Just Sense of Gratitude, begs leave to return thanks to his numerous Friends for their late liberality and kindness to him, and to acquaint them and the public that he has beeen enabled to lay in an entire Stock of GROCERY and DRAPERY GOODS which he can offer on as low terms as at any shop in the trade, and hopes by strict attention and assiduity to merit a continuance of favours he has for so many years received. N.B. Genuine TEAS and COFFEE of the best qua-lity at very low prices. Funerals completely furnished. There appears to be a tiny graphic - a wreath? - in front of the statement about funerals. 'Cousin Wendy' (many thanks!) discovered from the Ipswich Journal in 1812 that Joseph was again 'advertising a fresh supply of Dr Bateman's pectoral Drops' and also many other pills and elixirs for sale! As the gaps in his fortunes are gradually filled in it is fascinating to discover that he was not just the local 'chemist' but also the draper, the grocer, the tailor and even the funeral director! He is also known to have been involved in church affairs in some capacity. Quite an entrepreneur! On 24 Oct 1805 Samuel Jeaffreson Esq. had been appointed Captain of the Hollesley Bay Volunteers. (It appears that if someone of higher rank than 'Gent. ', e.g. an Esq or baronet joined a group of Volunteers he automatically took command.) Samuel Jeaffreson, born in Melton in 1775 was the son of Christopher Jeaffreson (mentioned above, witness to the marriage of Joseph and Mary,) and a cousin. [See the Searles line.] Hollesley Bay was a small hamlet on the R. Deben near Melton, no doubt considered very vulnerable in the event of an invasion by the French under Napoleon. (Mothers used to threaten naughty children that 'Bony' would get them). The London Gazette announced on 1st Mar 1809 that Joseph Oldham, Gent., and a Samuel Thompson had been appointed as Lieutenants in the Hollesley Bay Volunteer Infantry. Joseph's eldest son 'Richard Wood Oldham Gent.' had been an Ensign with the Melton Volunteers since 14 Aug.1798. He was appointed as Lieutenant on 11 Oct 1803 and again as 'Ensign without Purchase' on 22 Sep 1804 and 1 Nov 1805, Samuel Thompson was made ensign here in 1803 and 1805. If they were dressed in the same way as Volunteers in 1782 their uniform would be green and orange, as described in the Norfolk Chronicle (and published online by the British Library Newspaper Library). From the description the local farmers who made up the force were Home Guard, Civil Defence and local police when necessary rolled into one. 1) to Elizabeth Johnston of Melton on 27 Nov 1810 - her gravestone is large one at the back on the right as she was buried with Daniel Johnston, Governor of the House of Industry (i.e. workhouse) at Melton. He died 3 Jan 1807 aged 57 and she died 21 Jan 1817 aged 18. The inscription is not clear and appears to suggest she was Daniel's widow as well as wife of Richard! It seems reasonable to assume that she was more likely to be Daniel's daughter. On the left in the same row is the 'vault' of Richard and Mary Wood and next right a 'double' gravestone for Joseph and Mary. The rest of the small stones are for Oldham or Wood children and/or grandchildren. The inscription on the Johnstone grave, the large one on the right at the rear of the photo above, reveals that Daniel was the Governor of the House of Industry at Melton (i.e. the workhouse, in a building which later became the Suffolk Lunatic Asylum). It appears that he was succeeded by Richard Wood Oldham when he died at the age of 57 on 3 Jun 1807. From the records of the children Richard remained in Melton till the 1820s when he moved for a time to Newington, which was rapidly becoming a suburb of London on the south bank of the Thames, being there from at least 1828. The A2A site has a record of the renewal of his Fire Insurance Policy with the Sun Fire Office, dated 26 April 1831-2 and then gives his address as Maryland Point Great Bland Street Dover Road. The location of this address is confirmed by an entry in Charles Booth's notebook, B634 p.13. Great Bland St - in the Trinity Ward of Newington (1891 Census) is now known as Burges St and is parallel to Dover St in Newington, Southwark, a stretch of the famous ancient route to Dover (on the other side are Tabard St and Pilgrimage Rd, etc) Cardinal Bourne St, a cul de sac running north off Burges St, was originally called Lower Bland St and ends at the rear of buildings which must face onto Dover St. itself. Two of William Oldham's children (nephews of Richard's) were born in this area in 1823-8 as were five of his eight children between 1828-35. The 'Maryland Point' part of the address is misleading as it suggests a place in Stratford, E.London now preserved in the name of Maryland Station on the line to Ipswich - but nowhere near the Dover Rd. Perhaps he just called his house Maryland Point! At least 4 of the children were baptised at Holy Trinity between 1828 and 1836 as seen immediately below. 1. Maria Oldham married James Reed, a watchmaker, b. Liverpool 1818. Lucy, their daughter was b.1862 in Liverpool. Lucy married Matthew M.Corney in Liverpool in 1890, but neither the marriages nor Lucy's birth are yet listed on Free BMD. 2. Joseph Oldham's two marriages (? ), to Julia Ann then to her sister Fanny Louisa, together with his and Fanny's children are on the page with the Oldham-Dorning family. The actual date of Maria's and Joseph's birth is unknown but they could have been just 11 months or so apart. 3. Elizabeth Oldham was acting as housekeeper for Joseph when he was stationmaster at Bangor, Caernavon, Wales, in 1851. She married Archibald Arnott McMillan, a Scot (b. 1825), who was a London and North-Western railway (LNW) Bridge Inspector at Menai, on 18 Mar 1852 in Bangor, and had 9 children (details available). Richard was there from Liverpool for the wedding. Elizabeth and Archie moved to Rose Place, Conway from where he could easily travelled to Menai by train every day. They were still there in 1881, living at Rose Cottage with Archie listed as a civil engineer. He was involved in the construction and maintenance of the famous Britannia Bridge across the narrow gap of the Menai Straits between Wales and the Isle of Anglesey. The bridge was a vital link, not just to the island but to Ireland as it opened the route from Holyhead to Dublin, a much shorter sea crossing than the one from Liverpool which is nearer to Belfast. It became the preferred route from London and continues to be very busy still. Elizabeth died in 1907. With many thanks to cousin Wendy, a descendant of Elizabeth, who supplied much of the information here (and much more) Details of Elizabeth's children can be found on the (free) 1881 census, living at Rosemary Cottage, Conway, Caernavon. 4, 5 & 6 These children are shown on the same batch no. as Lucretia, C039391. There is no further record of them at present. 7.. Lucretia Oldham married Morgan Evans in Bangor in Jun 1879, Morgan being a Scripture Reader. (The original error of dismissing this marriage was finding a Lucretia in 1891, born about the same time but in Anglesey and with several children, all old enough to rule out Lucretia Oldham who was born on 24 Dec 1835 and about 44 when she was married. Also, according to the 1881 Census she was then only 42 - so, a warning! - censuses are as subject to human error as any other document, and transcriptions can be unrecognizable!. 8. Martha Oldham - both the last two children were staying at a boarding house run by a family called Henderson on Catherine Terrace, Wallasey with their mother Maria in 1841. It must have been a great contrast to the crowded and unhealthy streets of Newington. The benefit of fresh air and sea breezes was already being talked about, and in addition, since the Prince Regent had built his Pavilion at Brighton, the idea of the 'holiday' was becoming popular. In 1851 Richard is listed in Wallingford, visiting his brother John. He was accompanied by his wife Maria and two daughters, Lucretia then 15 and Martha Ann, 13 or 14. Joseph was probably till living in Bangor when Richard Wood Oldham died there on 23 Nov 1854 at Summerhill Terrace, aged 74 or 75. Less than a year later, in June 1855 Joseph married Julia Ann Dorning and moved to Cheshire. See Oldham Part 4 for more on Joseph and his children. Richard's wife Maria was about 15 years younger than him and survived him by nearly 25 years. She was living with her daughter Lucretia in Conway in 1871 but Lucretia moved to Bangor after her marriage. Maria died at Rosemary Cottage, Conway, on 2 Jan 1880. The original census entry has two vital mistakes which made it hard to find Maria - her birthplace of Bungay looks like 'Rungay' and the enumerator had omitted the 'h', writing 'Oldam', and also put 'Middlesex London' (over something else) instead of Newington plus Southwark or Surrey as Lucretia's birthplace. It would have been acceptable to write 'London' already, but Middlesex is across the Thames! Beliza was born in Melton and baptised on 24 Mar 1782. She never married but is recorded on the 1841 census as living on Victoria Terrace, Woodbridge Rd, in Ipswich along with a Mary 'Macfarlan' who must surely be a relation of her brother- in-law, Lt William MacFarlane RN, husband of her sister Harriet (no.7 below), in which case 57 is a better reading than 51 as one transcription has it. Beliza was the older by one year and both of them were 'independent'. Beliza died in 1850 [Free BMD Ipswich Vol.12 p. 253) and was buried on 6 Jun at the Unitarian Meeting House in Ipswich. They would have been left a sum of money by their fathers to be invested to provide a regular income, such that if they married their husband could not 'intermeddle' and take possession of it. All of a woman's property, including the clothes she wore, would have automatically become her husband's property on marriage. Mary was born in Melton and baptised on 30 Mar 1783. No-one of the right age has been found later so it seems likely either that she died young or is the M.Oldham aged 65, living in Chipping Ongar, Essex, in 1841 with an (unidentified) Ann Oldham aged 70., both single, both independent. emigrated to South Africa and is included with the '1820 Settlers' below. In 1841 they were living in Church Row, Wickham Market, only Beliza 'at home' aged 15. William, 55, is described as now 'Navy H.P.' (?) The one other member of the household was an unknown baby, Emma Barker aged 7 weeks, perhaps the child of Harriet Sarah for whom a marriage has not yet been found.. Next door were living two 'Independent' ladies, Mary Brook and Emily Jeaffreson. (See the Searles family for previous connections with the surnames Brook and Jeaffreson) Those not listed here haven't been traced further. 4. Walter McFarland is found as a lodger in the Piazza Tavistock Hotel, Covent Garden in 1871 aged 48, described as a 'merchant'. He is further revealed, now 59, on the 1881 census as a retired ship owner living at 1 Mayfield Rd, Wimbledon, Surrey with his wife Helen Maria (nee Dryden), born about 1840 at Leeke Wootton in Warwickshire. They married in Wandsworth in the Sep Q of 1872 and had 3 daughters, Emmeline 7, born in Aldborough, Suffolk, Mabel Gerard, 3, born Lower Merton, Surrey and Ethel Dorothy D. 9 mths, born in Wimbledon, three moves over the ten years. A cook and a housemaid completed the household. (Emmeline's birth is recorded without a first name). Their mother died in 1885 and in 1891 all three girls were in boarding school in Wimbledon. What became of them after their father died is not known. 6. George Alexander became an officer in the navy like his father. In 1861 aged 34 he was a 'Master', stationed on HMS Isis in a 'Home Port' though which one is not known. [RG number:RG09 Piece:4492 Folio:18 Page:1] He is found in 1881 [Ref RG11 Piece 5415 Folio 20 Page 11] as a retired naval Staff Commander in Charles St, Steynton, Pembroke in S.Wales with his wife, Eliza.Caroline who he married in the Dec Q 1853 in Haverfordwest, Pembroke. They had two sons, William George Vansittart born 1857 and Ernest H. born 1859 in Milford, Pembroke. In 1891 George and Eliza's address is given as 48 Charles St, Steynton, Milford. It seems likely that they had never moved. Harriet, 'widow of the late Lt William MacFarlane R.N. of Wickham Market and daughter of Joseph and Mary Oldham of this parish deceased' was buried in Melton. So reads Harriet's flat tombstone in the shadow of the old church in Melton, close to the rest of the family graves. She died on 20 Apr 1859 aged 71 years. As can be seen from the tree below 'Searles' was the surname of Richard Wood's wife, found on her gravestone in Melton and solving a long-standing mystery. See the Searles family for full details. The name was carried on down through the family as a first name with at least one more on the Wood side in a later generation, not shown on the tree below. (See the Wood Family for other descendants of John Wood.) Oldhams are continued below. According to the IGI, Searles Wood Oldham was baptised as 'Ron Searles Wood Oldham' - but he is recorded everywhere else as just 'Searles', like his uncle, Searles Wood, and 1st cousin, Searles Valentine Wood, in the Wood family. (Ron) Searles Wood Oldham son of Joseph & Mary, chr. 9 Jul 1793 Melton SFK, entered the navy and is listed as Lt Searles Wood Oldham R.N. Most of his career is unknown but he would have begun as a midshipman. Information from an 1832 Poll Book gives 'Searles W. Oldham Gent.' as resident on Sackville St, Everton' Liverpool. This was the first election after the first Reform Bill, held on Wednesday 12th and Thursday 13th Jun 1832 with 4 candidates, 2 Liberal, 2 Conservative, presumably two each day. Unlike more recent elections voting preferences were recorded so we know that Searles voted for the two Conservatives, Lord Viscount Sandon and Maj-Gen Sir Howard Douglas, Bt. Mr Ewart, Liberal and Lord Sandon, Conservative, were elected. Searles retired to Hope St, Liverpool. There he invested about £1200 in a sail-making business with a Margaret Ann Gladstone. His brother Richard was a sailmaker and in his Will of 1842 Searles describes him as 'my brother Richard, Bookkeeper in Liverpool.' In 1841 Richard was living not far away from him at Walton On The Hill, Everton. Perhaps Margaret Gladstone was the one born in Scotland about 1796 and living in Juvenal St, Liverpool in 1841. Her son John, 21, was a sailmaker! Two others were in their twenties and one was only 6 so this one, similar in age to Searles, seems the best candidate. Charles Frederick Wood Oldham, chr. St Peter's, Liverpool (IGI P020273) on 2 Apr 1832, became a surgeon in the army with the rank of Major although on the civil list in 1859, in the Shahpur district of India. He was there for many years but returned to England before 1891 to live at The Haugh, Sutton, Suffolk where he is described as a retired Brigade Surgeon. He had 5 children. The eldest, Leslie, born in London in 1860, married Caroline Doyle, sister of Sir Arthur Conan Doyle and as a Major in the army was killed in France in 1915. The other 4 were born in India, daughter Mary being still 'at home' in 1891 aged 18. Charles is said to have died in New Zealand. In 1841 Searles was staying with Lucretia Oldham of Melton, widow of Thomas Westley Oldham and her brother, William Chapman Oldham at Frith House in Leicester. The details of the three Oldham families, with two of them inter-marrying, are listed in the Oldham Family Part 1. Whether the three families were related initially is still a mystery, but it's fortunate perhaps that Searles was more original with his children's names - only a Lucretia and no Joseph or Beliza! The Brook(e)s family probably came from Leicester and could have been part of the same social group as the other Oldhams. Searles left a will in which his wife is of course the chief beneficiary. He also gives some very interesting details about his business affairs. 'I appoint my brother Richard Wood Oldham Bookkeeper in Liverpool.' and about his 'business partner', a Margaret Ann Gladstone in the Sailmaking. He had invested about 'twelve hundred pounds in sterling money' and gave directions about what to do wth it from the sale of the business - what stocks & shares to buy etc. The only matching Margaret Ann Gladstone on the 1841 census is a widow born about 1796 in Scotland and living on Juvenal St Liverpool with, presumably, her 5 children, John 21, Margaret 20, Robert 15, Jessie 12 and Hugh,11, and this identification is surely clinched by the fact that John is described as a 'sailmaker'. His brother Robert, who could be older than 15 but still less than 20, is an 'App. BroKer'. (The handwriting is terrible and the enumerator has scribbled over the first thing he wrote, but it appears to be this). He is probably the John M.Gladstone living in Rhyl, Denbighshire in 1861 with a son called Hugh, who is involved in ''Merchant Shipping'. Gore's Directory of Liverpool, 1825, gives Hugh Gladstone, sailmaker, at 8 New Quay, and Moffat ditto at 8 New Quay. Gore's Directory of Liverpool, 1827, gives Hugh Gladstone, sailmaker, at 3 Crabtree Lane and also Gladstone & Moffat, sailmakers, 10 New Quay. Pigot's Directory of Liverpool 1828 gives Hugh Gladstone and Moffat at 9 New Quay. The changing numbers on New Quay (still part of the central waterfront but transformed by modern architecture) could be a re-numbering, not the sailmakers moving, though of course they could have wanted larger (or smaller) premises. Sails were made from flax (linen) traditionally, usually in the form of canvas which is very heavy but not very hard-wearing, Later they were often made of cotton which was lighter. At this time they would still have needed repair or replacement quite frequently. Looking back it is now possible to see how in fact three of the brothers may have been involved, one way or another, in the sailmaking, not just Richard and Searles but also John who was familiar with the buying of cloth, especially in London, and would know where to go for the best deals. Such business could account for Richard's visit to John in Wallingford in 1851 and perhaps there were many more visits not recorded, being between the censuses. Colonisation of South Africa by white settlers began quite early, with firstly the Dutch in the 17th century, encouraged by the Dutch East India Company, followed by Germans, Walloons, and people of Huguenot descent. By 1800 the population of Cape Colony was 16,000 people of European descent, 17,000 slaves and an unknown but very large number of Africans. Britain annexed the colony in 1806. In 1819 the British Government began a scheme to encourage emigration to the Cape Colony, promising 100 acres of land and free passage. It was hoped that they would help in controlling a situation troubled by incursions of the Xhosa tribes across the border. About 1000 families agreed to go. The British were also then still outnumbered, with about 8000 British settlers, but 14,000 Dutch. Nevertheless it is claimed that the impact of the 1820 settlers on the history of South Africa was enormous. In 1836 the Great Trek began with many of the settlers of Dutch descent known as Boers moving north to set up their own colonies in the Transvaal and the Orange Free State. There were more difficult times ahead with Zulu wars and later at the end of the century, wars with the Boers. Eventually Natal, Transvaal and the Orange Free State were reunited with South Africa in the Union of South Africa in 1910 and in 1994 white minority rule came to an end with the enfranchisement of the black population. The ages of the emigrants, men, women and children, is given on the ship's passenger record. Joseph Oldham was 33, Thomas 27 and Edwin 21. It appears that Joseph was originally intending to form a party himself, probably of about ten men - including his two brothers, Thomas and Edwin, with their families, to take advantage of the government offer of free passage and 1000 acres to settle in South Africa. This plan fell through, probably for lack of support - the total number of settlers was only a fraction of those the government had hoped for when the scheme was proposed by Mr Vansittart (later Lord Bexley), Chancellor of the Exchequer on 12 Jul 1819. They allocated £50,000 towards sending 4000 people to the Eastern Districts of Cape Colony. At the start 90,000 applications were submitted and 4000 selected. The actual numbers of those who eventually embarked in 26 ships for Cape Colony were less than half that. Joseph's proposed party suffered the same lack of firm support and by the time they set sail the three Oldham brothers had joined John Baillie's party instead..The reason for going in a party appears to have been to send groups to particular districts with some restrictions on their movements. Later when one of them wished to move elsewhere he had to get permission. In theory there would have been some kind of support for the settlers on arrival and it shows that various townships were deliberately planned. At last Baillie's party embarked at Gravesend on the SS.Chapman on 3 December 1819. They arrived in Table Bay on 17 March 1820 and landed at Algoa Bay on 10 April 1820. This was of course many years before the construction of the Suez Canal, so all the passenger and cargo ships to India, Australia and the Far East would have taken on fresh water and supplies at Cape Town or elsewhere.along the coast. The towns were expanding rapidly though up-country the settlements might be only sparsely occupied, if at all. Many of the settlers in applying to join the scheme had described themselves as farmers though in fact they were mostly from the towns and from London, clerks, small shopkeepers and labourers competing for a shrinking job market and a slump in trade as the soldiers and sailors returned from the Napoleonic Wars. Many of them found the land they had been allocated was poor soil, they had no idea how to run a farm anyway, and eventually abandoned the idea, drifted back to the towns and returned to their former jobs! In South Africa Lucretia became an assistant teacher at a school founded at Bathurst by one of their party, a Dr Edward Roberts. Mrs Louise Roberts continued to run the school in the 1840s after her husband died. Her maiden name was Biddulph, her family coming from Staffordshire, so they might have been distantly related to the Wright-Biddulphs of Burton Park. There were also more Biddulphs among the 1820 Settlers, many from London but probably of the same 'clan' as it's a very localised name. Mrs Roberts later remarried, becoming Dyason. Lucretia, known as Lulu, married William Selwyn, who was recorded in 1851 as a clerk at the Eastern Province Bank in Grahamstown and who published a book of poems and verses. By 1857 William was a cashier at the Commercial Bank, PE. They had two daughters, Emily and Lucretia, also known as 'Lulu'. Other sources in the IGI for this family are on films 538073, and F1660021. The records have been added in a submission to the LDS on 'Patron Sheets' between 1969 and 1991. The records from St George in the East are said to be copied from the parish registers, referred to as 'day-books' with records dating from 1729-1879. One record incorrectly gives Josepha as Joseph, male. Joseph died on 27 Apr 1858 aged 73 and was buried in the Irish Cemetery on Robben Island. Thomas's age on embarkation is given as 27. The (IGI) record gives his baptism as 27 May 1795, so assuming this to be correct he would have been born about 1792/3. 'Wesley' could be a mis-spelling of 'Westley' (see Oldhams Pt 1) but as that originated with Ann Westley and her marriage to William Oldham of Leicester it is unlikely.There could be many reasons for choosing such a middle name, e.g. in memory of the Wesleys, lately deceased, though there's no evidence of the Oldhams having an interest in Methodism, nor has any other reason yet proved very convincing. After he had been in South Africa for a while Thomas bought a 'Dutch shipwreck', Zeepaard (beached at Cape Recife) from which he built a schooner 'Perseverance'. (The only 'Zeepaard' identified was a Dutch schooner of the 'Gulden Zeepaard' which was wrecked about 1692. ). Edwin was born about 1799-1800, presumably also in Melton as his younger brother, Charles, the last child of Joseph & Mary, was baptised there in 1803. Edwin does not appear in the IGI, but the reason for this omission is guesswork without consulting the original records. He sailed with his brothers Joseph and Thomas to South Africa and was recorded as being a storekeeper in 1822 in Cape Town, selling drapery and tableware. Edwin married Eliza Marianna Rogers in 1829 in South Africa. M.D.Nash in '1820 Settlers' refers to her as Eliza, Edwin's only child but the family also remembered her as Elizabeth. They had just one daughter, Mary Elizabeth Oldham who became Van der Schalk on marriage. Edwin died in South Africa on 10 Mar 1859 aged 59 and was buried in the Irish Cemetery on Robben Island.. This child was found from his gravestone and Suffolk burial records. Born in the Dec Q of 1800, he was buried at Melton on 8 Jun 1803. The last! 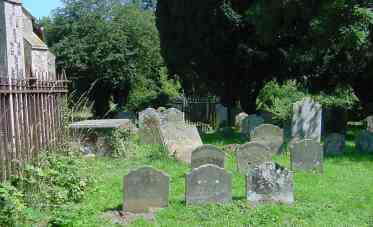 1803 was a terrible year for the family with the death of Alfred in June, and then Charles, baptised on 24 Mar, who was buried on 20 Dec. Perhaps the saddest part of the churchyard at Melton is the row of little graves in a long line together, with small white headstones most marked only with their initials. And could this be a 16th child of Joseph Oldham & Mary Wood?. This child was buried in Melton churchyard with one of the few clearly marked headstones. He was obviously related to both Wood and Oldham families but does not fit in Joseph and Mary's family as there was already a Joseph born in 1786 who was one of the 1820 Settlers in South Africa. This earlier Joseph died in Cape Town in 1858, though there is a slim chance that the name might have been used a second time even though the first child survived, a practice which is rare but not unknown. ____Of the rest of the children only two, Beliza and Mary were old enough to be mothers of Joseph. Beliza remained single till her death about 1850 but Mary's fortunes are quite unknown. ____Or perhaps a brother of Joseph sen'r had a son who married one of the Wood family.......... There were certainly very few Oldhams around in Suffolk so the combination of names in 'Wood Oldham' is very intriguing. William Salmon of Pettistree, Gent. Esquire William Salmon the Younger Eldest Son of the aforesaid William Salmon, Gent.